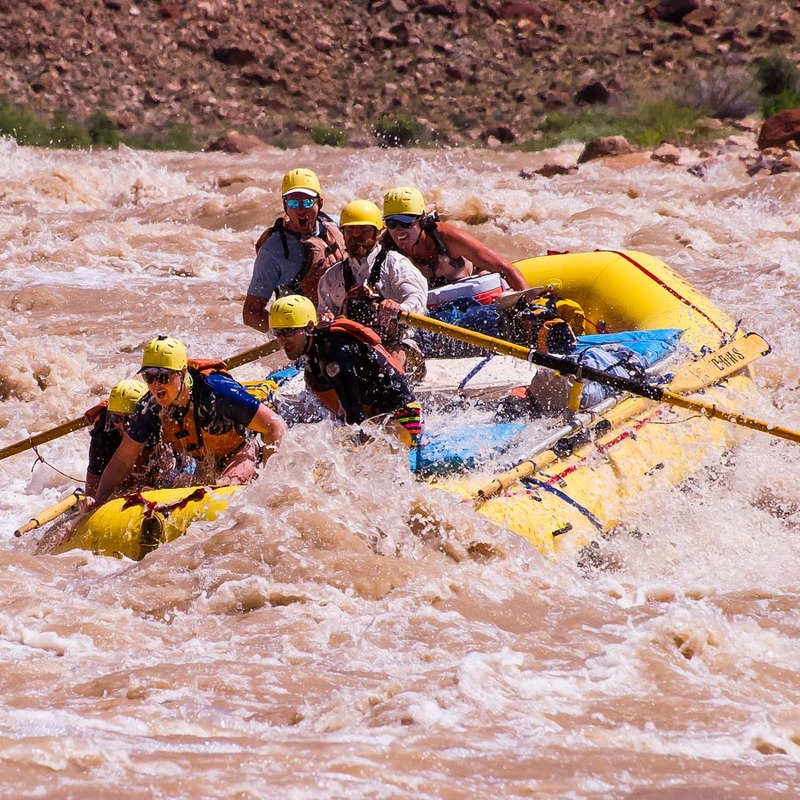 As a leader in rafting and adventure travel since 1969, you could say we know a thing or two about providing an unforgettable vacation. Every multi-day adventure with OARS combines amazing rivers, friendly guides, incredible scenery, quality gear, comfortable camping and unexpectedly delicious food, but the OARS multi-day experience is the unique and captivating sum of all those parts. It’s so much more than a river trip. An OARS multi-day adventure is about losing track of what time it is, or even what day of the week it is. It’s about leaving emails and text messages and Facebook at home. It’s about drifting off to sleep on a beach under a canopy of stars, and then waking up the next morning to watch the sun rise over the canyon rim. The OARS multi-day adventure experience is what happens when you leave behind the hustle and bustle of everyday life and let yourself sink into the simple rhythm and joy of life on the river. Your vacation is finally here. Now you just have to sit back, relax and enjoy the ride downstream while we take care of the rest. Our guides, who are the single-most complimented component of our organization and recognized as some of the best in the industry, will greet you and explain in detail what you may expect throughout your trip. Trained in CPR and First Aid, swiftwater rescue, Wilderness First Responder, and Leave No Trace principles, our guides are professional, playful and ever mindful of your wants and needs. After all, we want you to have a fun and memorable experience. 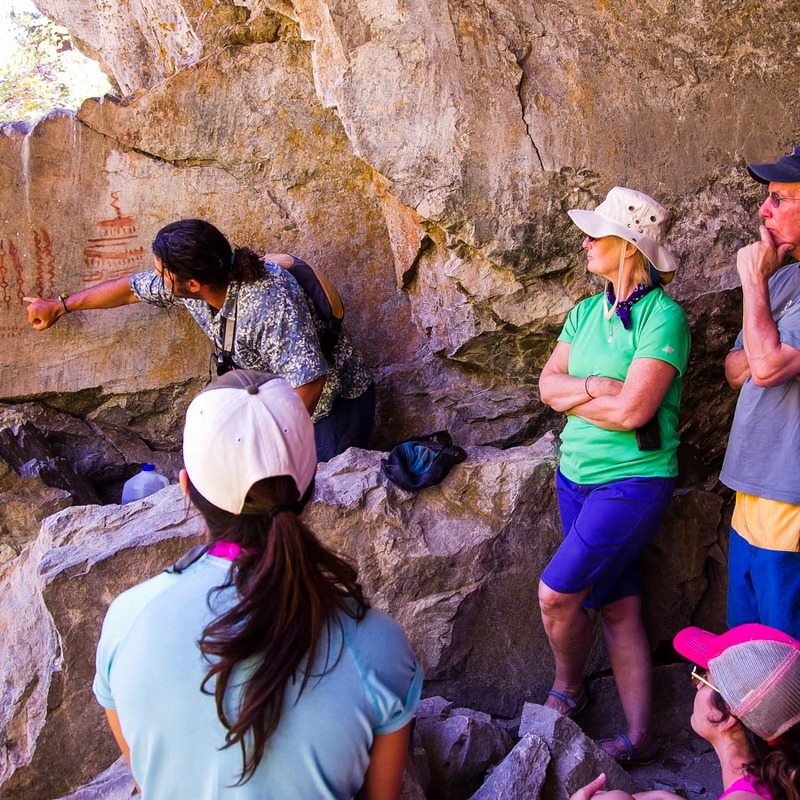 Your trip leader will provide a detailed safety talk and distribute the appropriate gear. OARS’ boats and equipment are top-of-the-line and well-maintained. Depending on which river you choose, water levels and group interests, you may encounter several types of boats in your destination. From paddle rafts and dories to inflatable kayaks and stand up paddle boards, each ride in the OARS fleet offers a different experience. So whether you want to challenge yourself or just chill out, you’ve got options. Now the real fun begins. Get ready for some whitewater! After a morning of river running, your guides will find a sandy beach or otherwise appropriate place for lunch—the first of many moveable feasts you’ll have on your trip. 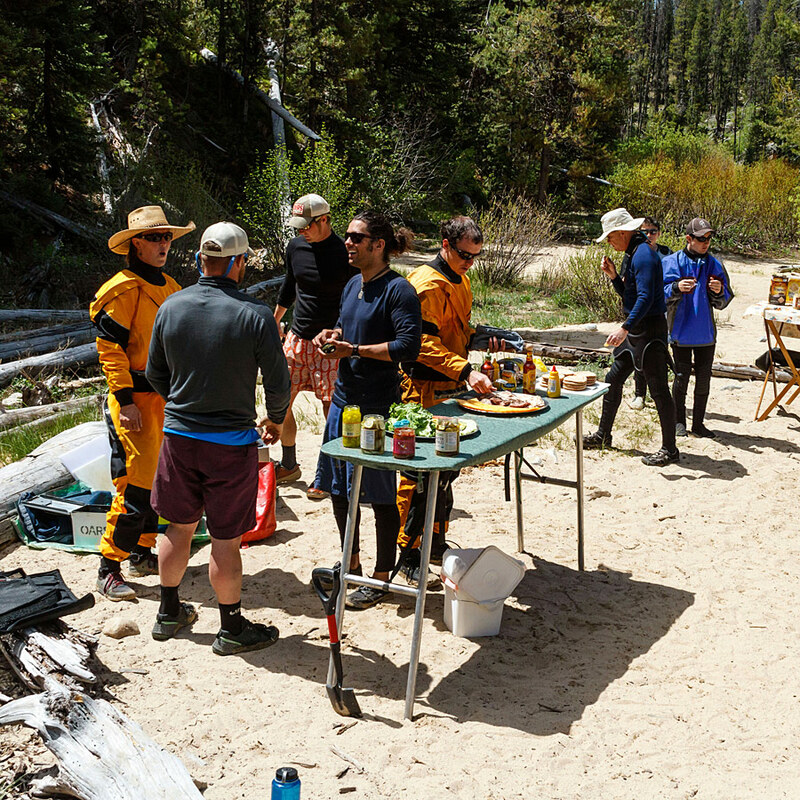 As they prepare lunch, you might recall the morning highlights with friends, family and fellow travelers before returning to the rafts for another thrilling ride to camp. In most cases, you are on the river for no more than +/- 6 hours a day—just ¼ of your day—which leaves a lot of time for hiking, exploring, fishing, reading, napping and relaxing on the beach. Our guides are experts at finding the best camp spots away from other groups. You may often feel as though you are the only people on the river. Camp may be at a still, sandy alcove on the water’s edge, or a sunny, green clearing among mammoth cedars and towering cliff faces. There are often trailheads, fishing hideaways and swimming holes just a few steps away. OARS makes camping easy. The guides will handle all the heavy lifting and prepare camp—including a private location for the “groover” (bathroom). All you have to do is pick the perfect place to pitch your tent, carry your bags over, and set up your tent for the evening (your guides will give a demonstration on the first night and are always happy to help). The remainder of the afternoon and evening is yours to enjoy, whether you choose to play a game of horseshoes or bocce ball on the beach, join a guided interpretive hike, enjoy a good book or hang out with the guides as they prepare hors d’oeuvres, a hearty dinner, and dessert, of course. Now is the perfect time to enjoy the pleasure of a cold beer or soft drink after a hot day on the river or savor a glass of wine from a local winery. The choice is yours. 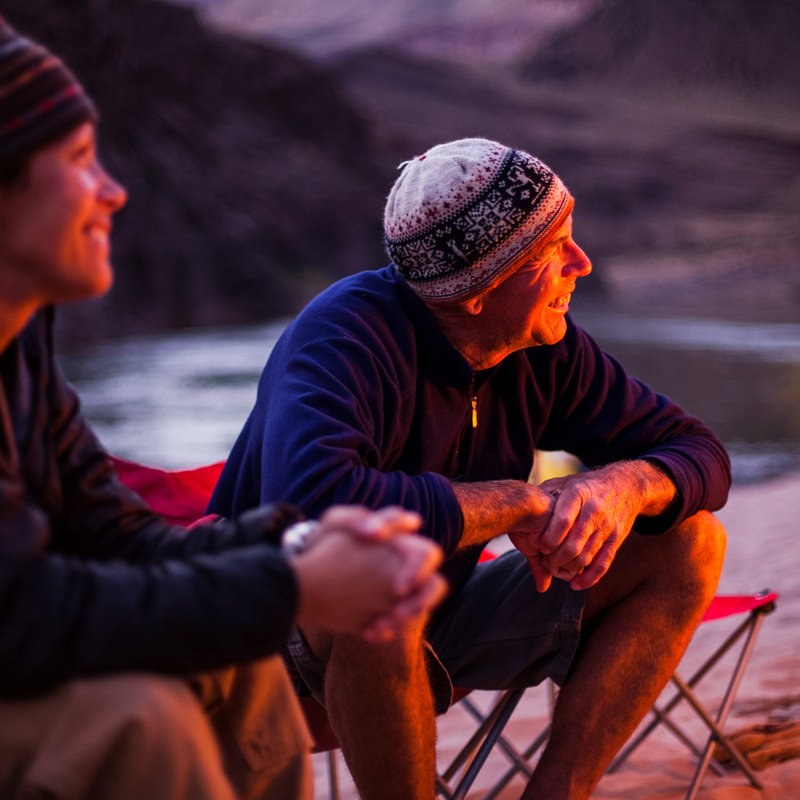 After dinner, as some of the guides clean up (we do all the dirty work so you don’t have to) and the day winds down, one of the guides may break out a guitar or recap the day with a larger than life tale from the river. 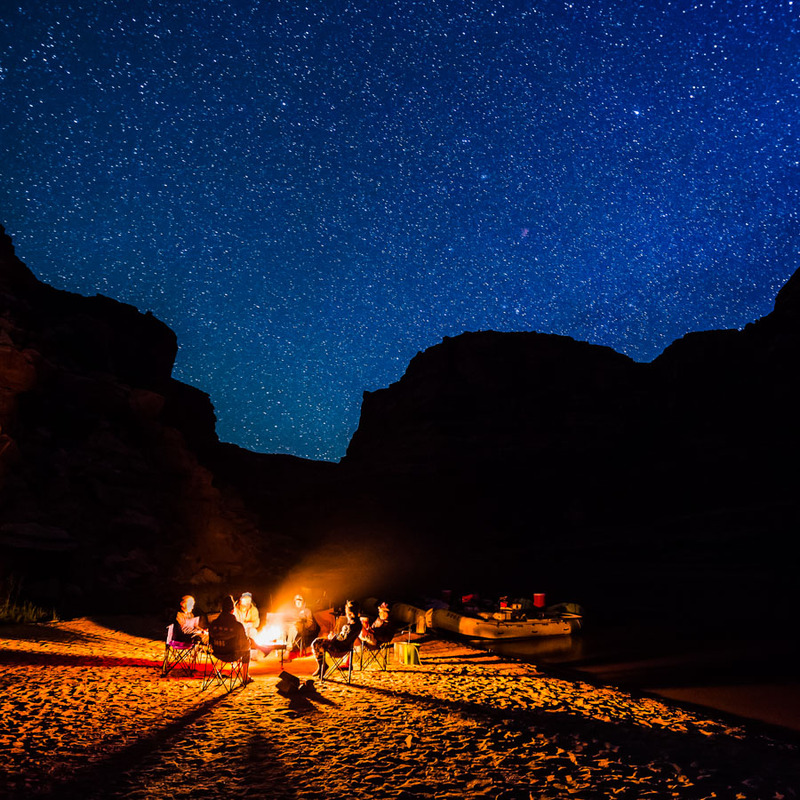 Evenings might include a star talk, a campfire, cowboy poetry, a joke telling competition or quiet time to contemplate a brilliant, unhindered night sky. As you curl up in your cozy sleeping bag for the night, you’ll fall asleep smiling knowing you get to do it all over again the next day. 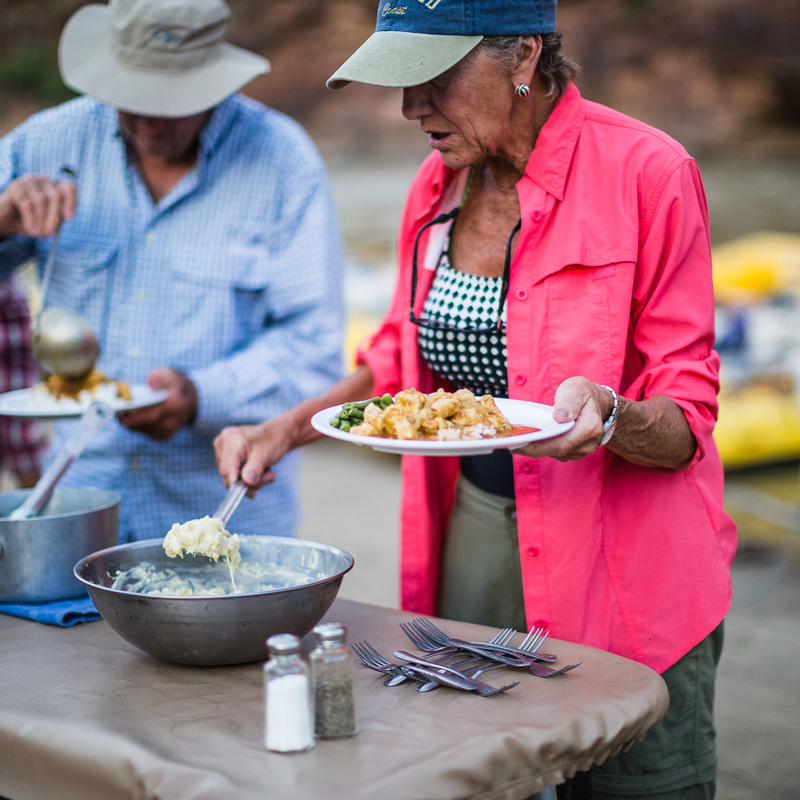 One of the most surprising aspects of a multi-day rafting trip with OARS is often the food. Expect to eat as well—or better—than you do at home, without having to do any of the work. 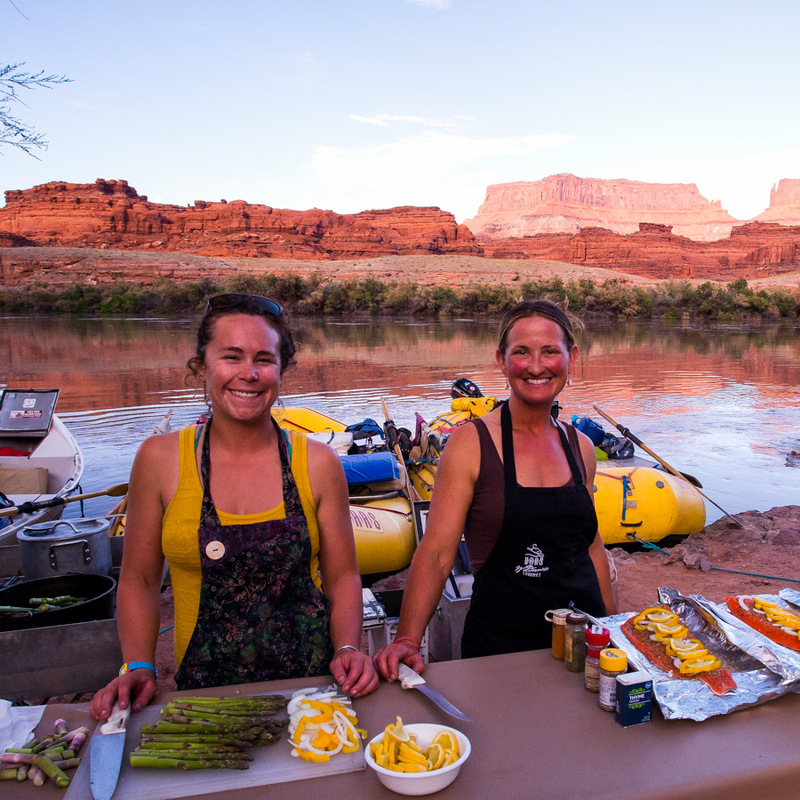 That means hearty and sumptuous meals, complete with fresh fruits and vegetables throughout the entire journey (even on 18-day Grand Canyon rafting trips!). Wake up to pancakes, omelets, or eggs cooked to order, complemented by bacon or sausage, juice, and plenty of fresh-brewed coffee, tea and cocoa. Satiate your appetite at lunch with a delicious spread of cold cuts and cheese on assorted breads, hummus and veggies in soft pitas, or tasty taco salad wraps. At the dinner table, our guides’ cooking skills truly shine. You may snack on hors d’oeuvres while waiting for vegetables, pasta, rice, and the main course: steak, grilled salmon, Baja tacos, sizzling fajitas, or perhaps delicious Dutch oven lasagna. And, if you can find room, there will always be something for dessert. If you have food allergies, restrictions or other special dietary requests, we will do our best to accommodate your needs. However, some specific needs can only be met if we charge you a supplemental menu fee to cover our increased costs. If you are a vegetarian or vegan and you let us know well in advance, we can provide meals for you without additional cost. We cannot always provide for the same diversity or sophistication as our regular menu for special dietary requests. 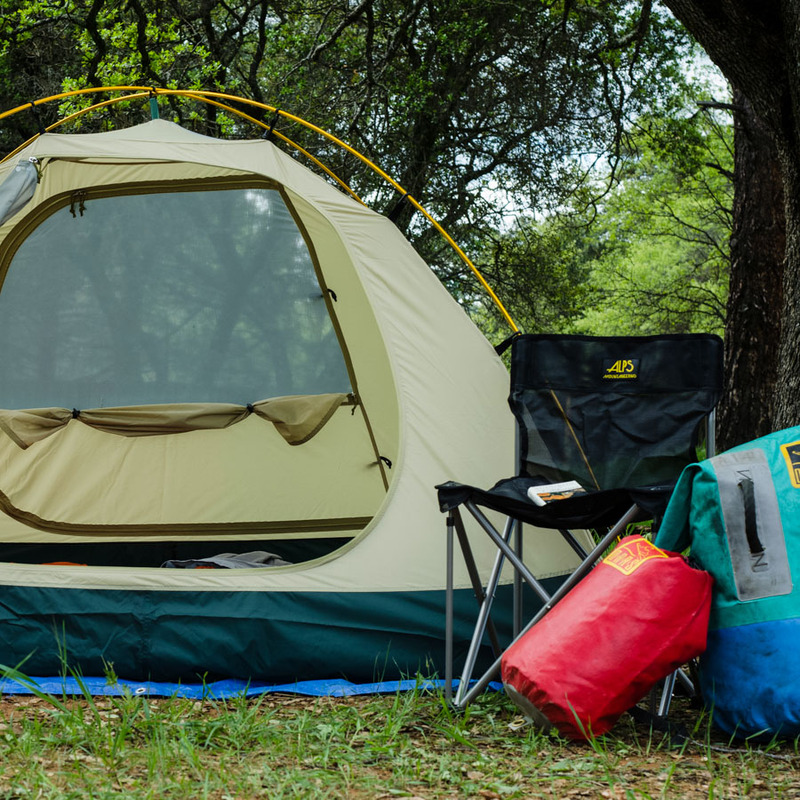 Roomy 3-person, free-standing dome tents on a shared basis for 2 people. Near the water’s edge or tucked up in a secluded spot away from your trip mates? We let you set up your tent where you want it. Sleep kits are supplied on some trips, or in most cases available to rent for less than the cost of checking a bag on your flight. 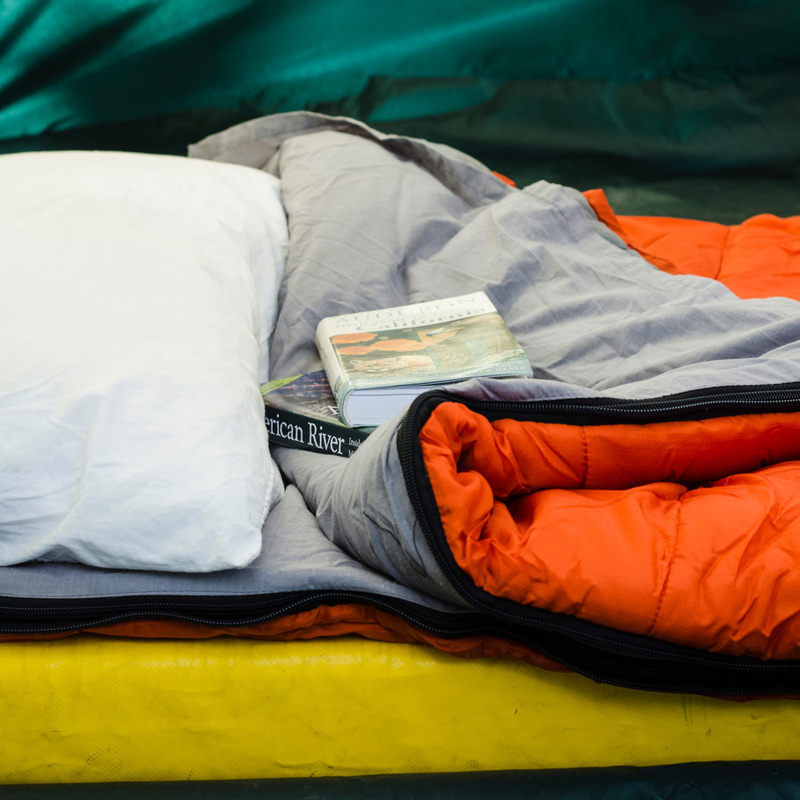 Sleep tight in a clean and cozy sleeping bag, freshly-laundered sheet, pillow with pillowcase (no rolled up sweatshirts here!) and a deluxe 3-inch thick foam and air-filled sleeping pad (see below). A ground tarp to keep your home-away-from-home tidy. Waterproof dry bags to keep your gear (a.k.a. checked luggage) dry and protected from the elements. A personal day-use dry bag keeps important items (a.k.a. carry-on luggage) dry and accessible during the day. Plates, bowls, utensils and a souvenir Klean Kanteen mug so you can enjoy all the yummy goodness coming out of the OARS riverside kitchen (yup, we bring that too). Comfortable camp chairs for everybody. Seriously, you might be surprised what other outfitters do or don’t supply. A loo with a view! A portable potty affectionately referred to as the “groover” that’s placed in a discrete location at each camp, plus toilet paper and convenient hand-washing stations. More than anything, it’s our goal to make sure your trip with OARS is super comfortable and completely stress-free. After all, this is your vacation and you deserve the best. Which multi-day adventure is best for me? When choosing your trip, consider the location, length of trip, time of year, activity level and age range of your group. 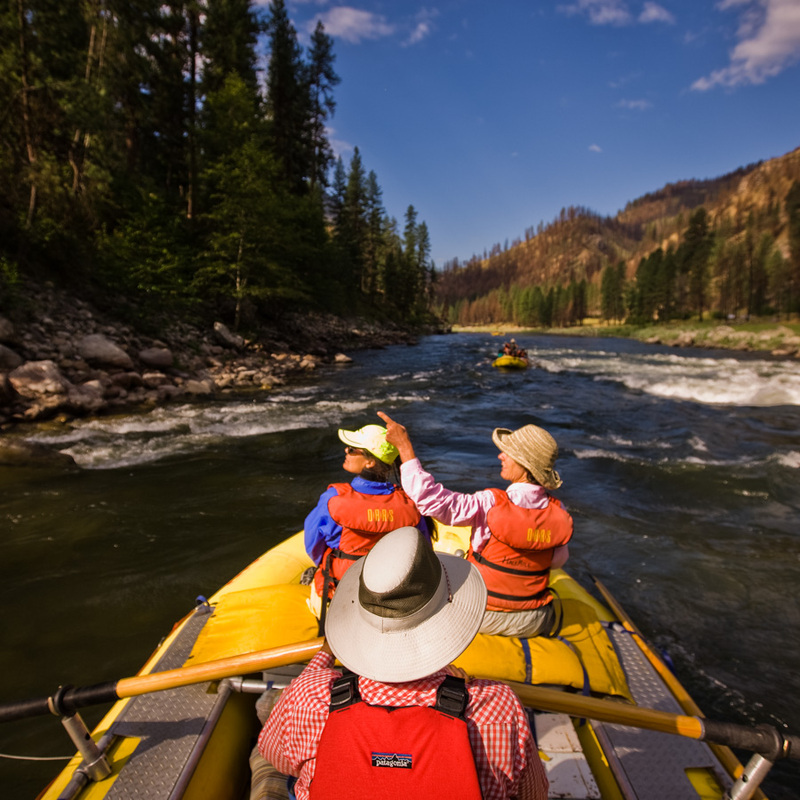 OARS offers trips everywhere from the alpine rivers of Idaho to the canyons of the desert Southwest; and activity levels ranging from leisurely Class II floats, to off-the-chart adrenaline-pumping rafting trips. The choice is yours. No. Most rivers are “pool and drop,” meaning there are exciting rapids interspersed with stretches of calm, relaxing floating, allowing you time to soak up the natural serenity. From a casual Class II float to maximum intensity Class IV & V whitewater, the ride itself is a lot of fun. However, we only spend a short amount of the long, lingering days in the rafts. The stops along the way are selected to provide excellent opportunities for walking, hiking, birding, wildlife viewing and simply immersing yourself in the magic and the majesty of the region. The chances of getting seasick are very low. River running is not like being at sea and does not seem to induce seasickness. Do I need to be young and fit to go rafting? OARS adventurers range in age from 4 to 84 and older. There are some physical requirements for joining our trips, weight restrictions may apply, and being healthy and reasonably fit certainly makes the experience more rewarding. People with medical conditions, including pregnancy, should have a physician’s approval before taking an adventure travel trip. Persons with various disabilities are welcome on OARS trips, pending a discussion of any special requirements. If you’re in doubt about your fitness for rafting, we recommend checking with your doctor before you go. Can I bring young children on a rafting trip? 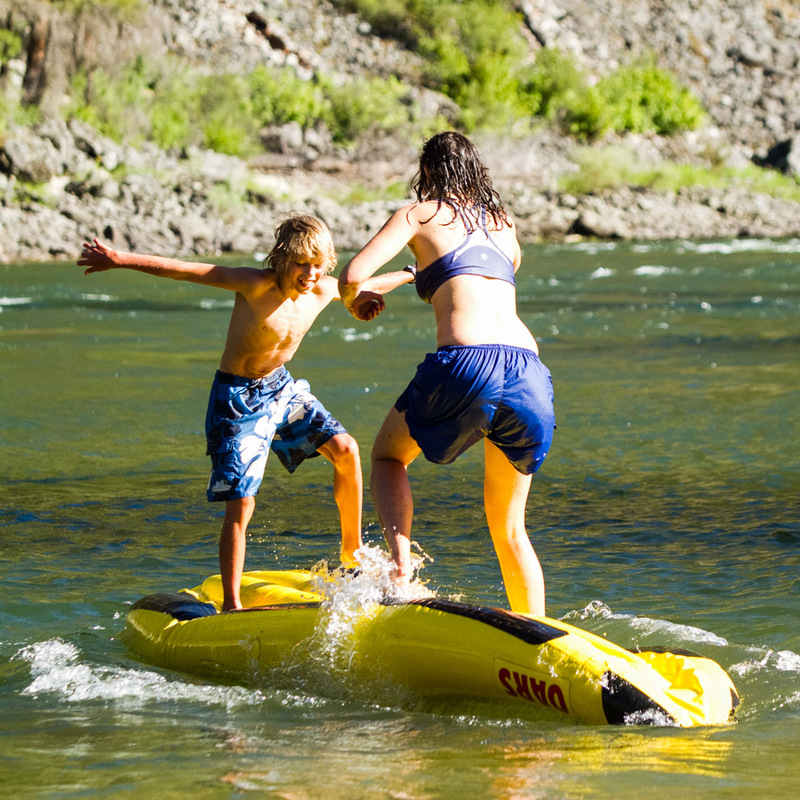 OARS invites children as young as four on some of our family rafting trips, although seven is the more common minimum age for Class III rivers. We want your kids to have the time of their lives, and we want you to be relaxed and able to appreciate their enthusiasm and delight. We shoulder the work and sweat all the details as you watch your child gain confidence and thrive in the natural world. 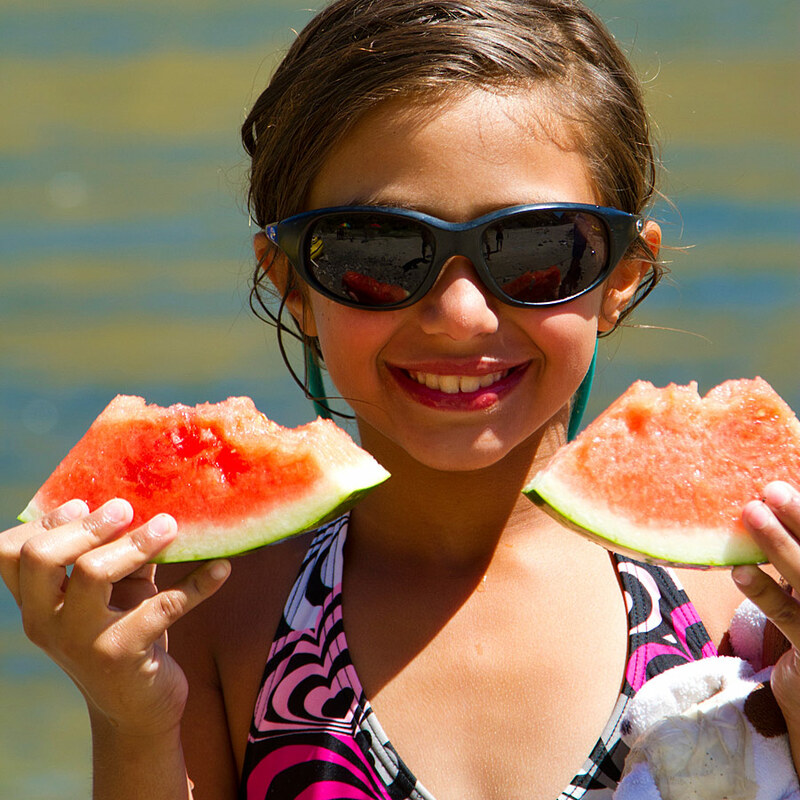 OARS offers more than 20 itineraries designed especially for family adventure. All OARS guests must wear our Coast Guard approved Personal Flotation Devices (aka PFDs or life jackets). Should you fall out of your boat, the PFD is designed to float you face up in the water. Before you get into your boat, however, our guides will give a detailed safety talk and show you how to properly “swim” a rapid. Please be advised our U.S. Coast Guard approved PFDs are rated to accommodate persons no heavier than 260 pounds and with a chest size no larger than 56 inches. We are experienced at accommodating people of all ages and abilities. What should I pack, and what should I wear on the river? In collaboration with our guides and operations managers, our expert adventure consultants have compiled detailed packing lists for each trip we offer. These documents include advice on everything from footwear (if you plan to buy footwear for your trip, make sure to make your purchase far enough in advance and break in until comfy) to what to wear on the boat and in camp, as well as what personal items are a must (e.g. water bottle & sun protection). What to bring on your rafting trip, and what to wear on the river, is as varied as the itineraries themselves. Your gear will depend on the time of year, water temperature and the weather for your trip. Watch our What to Wear & How to Pack video for more details. Of course! On all of our multi-day rafting trips, we provide each party with a small waterproof bag (17″ tall x 9″ diameter-approximate sealed size) to hold your camera and other items you might want during the day. It is secured in a readily accessible spot on the boat. While our bags are waterproof, to further protect your camera you may wish to place it in a Ziploc plastic bag, or special waterproof camera case. We also recommend padding it with a small towel or clothing. Sand can be a problem, so clean your camera every night with tissue, a brush and lens paper. We also strongly recommend you take out a rider on your homeowner’s policy to cover your camera-especially if it’s fine equipment. If you are planning to bring a digital camera make sure to carry additional memory cards, batteries, and any other extras you will need. 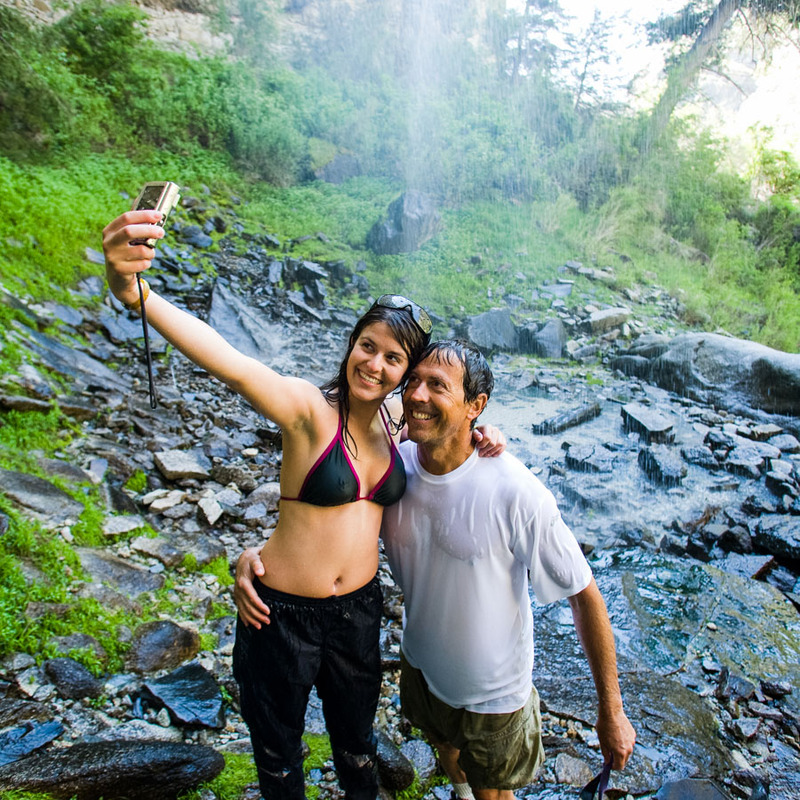 Disposable waterproof cameras are also a fun option. Guests often ask whether gratuities are appropriate, and in what amount. If you feel your guides have provided a very special trip for you, a gratuity may be left with the trip leader and will be shared among the crew. Entirely discretionary, anything between 8% and 12% of trip cost is a general tipping guideline. If you plan to tip, remember to bring a personal check or cash—ATMs are hard to find in the backcountry! One of the more mysterious parts of a whitewater rafting vacation is the toilet. The “groover,” always set up and removed by the guides, is placed at a discrete location away from camp and frequently has the most scenic vistas. Privacy is assured at every site, and sanitation is highly regulated. The toilet is a narrow metal box with its key feature being a rectangular lid that creates a watertight seal to prevent spillage while locking in the odors (well, most of them). An aluminum flange is placed on top of the box and a toilet seat is mounted on the riser. (During an early river trip back in the 1970s, shortly after this system was developed, the toilet seat was accidentally left behind, the rims of the riser left telltale indentations on everyone’s bums, and the box got a nickname: the groover.) There is always plenty of toilet paper, as well as a marker notifying other passengers when the groover is in use. Where it is not prohibited by local or national park regulations, our overnight trips include enough beer and wine to allow for about 2 drinks per person per night. Feel free to bring more beer, wine and other alcoholic beverages as long as they are in unbreakable containers. We provide some ice for drinks and a cooler for beer (or where space is limited, beer is “river cooled”). Drinking water is available at all times and meals include juice, coffee and tea. Drinking alcohol is limited to camping and lodging areas only, and is strictly prohibited while on the water. Although every effort is made to provide a safe trip for all, we strongly recommend that you protect yourself, your belongings, and your vacation through the purchase of a travel protection policy. A trip cancellation policy covers your non-refundable payments in most cases, should you have to cancel your trip due to illness or injury even at the last minute. 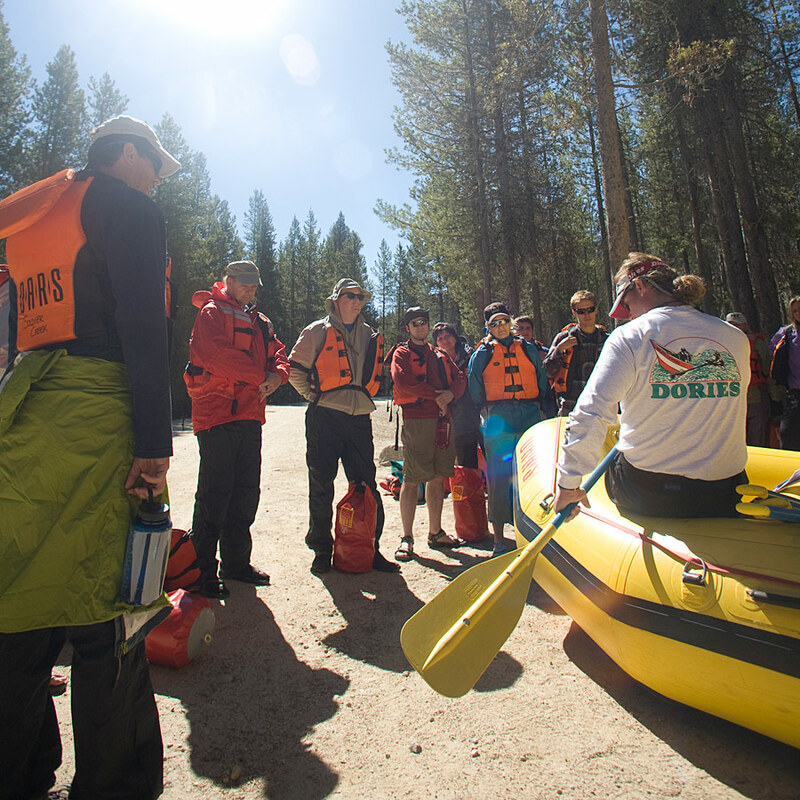 Trip participants should realize that in the event of illness or injury on a river trip, evacuation can be prolonged, difficult and expensive. Personal belongings and cameras are carried entirely at the owner’s risk, and OARS accepts no responsibility for lost, damaged, delayed or stolen property. Please call 1-800-346-6277 or 1-209-736-4677 or email info@oars.com for more information. Is OARS licensed to conduct river trips?